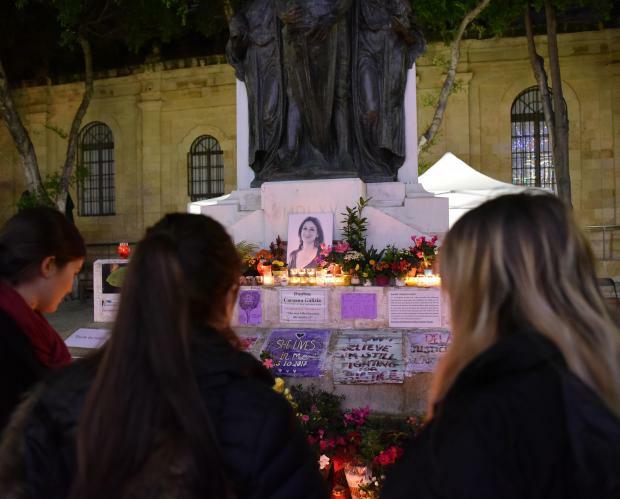 An Occupy Justice activist, who had only once personally met Daphne Caruana Galizia, told a court on Monday that she devotedly visits the Great Siege monument at least twice daily to replenish flowers and candles at the makeshift memorial to the blogger. Ann Demarco, a former banker, took the witness stand in the constitutional case filed by blogger Manuel Delia against the government over an alleged breach of his fundamental right to free expression, after flowers, candles and banners, symbols of protest over the assassination, were repeatedly cleared away from the foot of the memorial. Before September 8, when the monument was hoarded off for restoration purposes, items left by members of the public used to remain there for a month or so, before being removed, Ms Demarco explained. However, since that date, the items are removed shortly after being placed there, thus making it necessary for the Occupy Justice activist to visit twice daily on weekdays and once at the weekend, the witness explained. Before restoration works on the monument had started in September, photos, candles and flowers were always placed on the pedestal under the monument. Some plants, including a bay tree, had been planted in the soil and were regularly planted throughout the dry summer months, said Ms Demarco. Under cross-examination by Dr Chris Cilia, on behalf of the Public Cleansing Department, the civil rights activist said that the choice of the site, though strategically located opposite the law courts, had been spontaneous, a follow-up to flowers first being placed there by San Anton School pupils. Asked about ownership of the items, Ms Demarco said that these belonged to her and that no-one had asked her to place them at the memorial. As for Occupy Justice, the woman explained that this was a pressure group made up of women who got together after Ms Caruana Galizia's murder. Also testifying in today’s sitting was Christoph Schwaiger, the journalist who, on September 15, last year, had been physically stopped from filming public cleansing workers clearing away the memorial. Fortunately, the situation had not escalated, but the journalist had been advised by his newsroom to file a report at the Valletta police station, which he duly did. Dr Karol Aquilina, in his personal capacity and as legal counsel to Manuel Delia, testified as to how he attended all vigils and protests since the journalist’s assassination. He recalled one incident, back in March last year, when candles he had personally purchased and placed at the memorial, had disappeared the following day. When reporting the matter to the police, he had been told that officers had indeed spotted the alleged ‘thieves’ and had given chase. The two men had been Nigel Vella, Director of Raymond Vella and Co Ltd and Chris Galea, Head of Government Events at the Office of the Prime Minister, Dr Aquilina said, adding that no steps were taken. 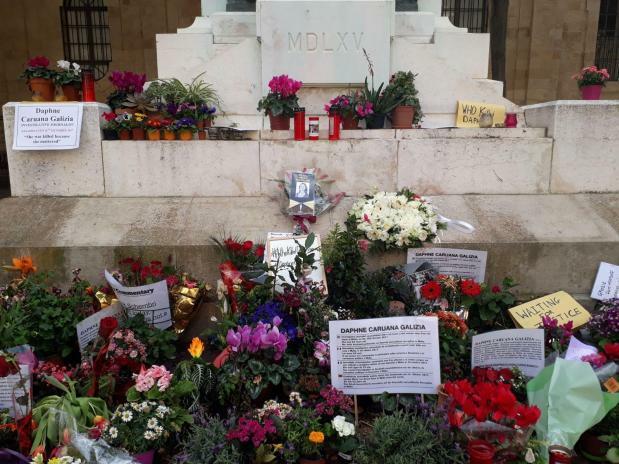 Another episode recounted by Dr Aquilina dated back to September 15 when he had gone to the Valletta police station with Mr Delia to report that the memorial had once again been cleared. In a brief phone conversation, Ramon Deguara, Director General of Public Cleansing, had seemed “very sorry” but had declared that he had been following personal instructions from Minister Bonnici. Mr Deguara had also informed Dr Aquilina that he had issued orders for the items to be returned to Mr Delia. Dr Aquilina also referred to a chance encounter with the minister in Valletta wherein he had told Dr Bonnici that what had happened was unacceptable and amounted to a breach of freedom of expression. At the start of the sitting, the court delivered a decree whereby it upheld an application by former PL Minister Dr Joseph Brincat for his intervention in the suit but only limitedly to assert his right to freedom of expression in stating that Valletta’s Great Siege Monument ought to be untouched. The case continues in February. Lawyers Therese Comodini Cachia, Jason Azzopardi, Eve Borg Costanzi and Karol Aquilina assisted the applicant. Lawyer Victoria Buttigieg and Joel Calleja assisted the minister.